Premium entryway that can truly express your personal style. Introducing the latest in great entrances with the new Classic-Craft® Canvas Collection™ – the first premium, smooth fiberglass door to carry the Therma-Tru brand name. The collection is designed with all of the beauty and performance of the Classic-Craft line with a smooth, paintable surface for ease of adapting to home interior and exterior finishes. No more worries about rotting, warping or twisting. 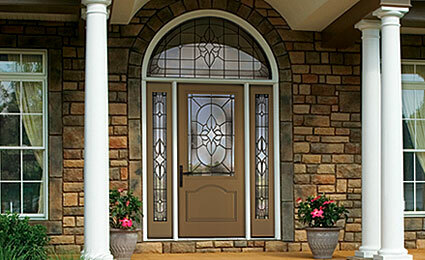 top and bottom of the door are protected by composite rails for a longer-lasting entryway. Classic-Craft premium entryways feel solid and close with authority. A 4-1⁄8″ wide piece of laminated strand lumber (LSL) wood runs from the top to the bottom of the locking side of the door to add mass and rigidity, giving the door weight and a natural wood feel. Built to stand up to the elements and years of wear, Classic-Craft’s fiberglass skins are thicker than standard fiberglass doors to provide added durability and better long-term performance. Stop moisture at every turn – and along every edge. Classic-Craft premium entryways havecontinuous hardwood edges that resist moisture penetration.